Crazy Colors is that type of addictive arcade game that players either love or hate, or both! Tap or click the screen carefully to let the tiny orb jump and pass an endless number of obstacles and color-changing power-ups. Make sure that the color of the obstacle always matches the color of the orb. If you touch the wrong color the game will be over. 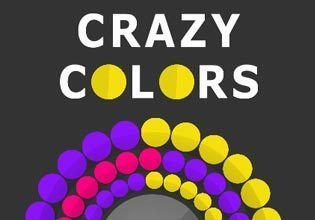 Crazy Colors features two different game modes. Set a new overall high-score in the Endless mode or try to complete 60 tricky levels as fast as possible in the Challenge mode. The stars collected in the Challenge mode can either be used to buy a Continue or they can be spend in the shop to customize your orb. Play Crazy Colors now for free and prove your superior skill!